The Shapeshifting Detective is the second FMV murder mystery game from D’Avekki Studios, following in the footsteps of the rather brilliant The Infectious Madness of Doctor Dekker – which I reviewed a few weeks back. Reviews for the latest ‘whodunnit’ experience are embargoed until 1 pm (GMT) on the 6th of November, which is the release date for the game. As I’m going to be covering the game in much more detail in less than 24 hours, I thought it would be a perfect time to share a bit more information on the game. Fans of Doctor Dekker will recognise this young lady! 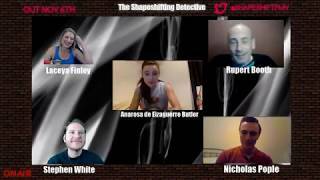 What is The Shapeshifting Detective? Dorota Shaw, a celebrated Cellist – just what secrets was she hiding and did she take them all to her grave? So, Check out our review, once the embargo has passed, and pick up The Shapeshifting Detective From Tuesday on the PlayStation 4, Xbox One, Nintendo Switch and Steam. Until then, check out the trailer below and enjoy!